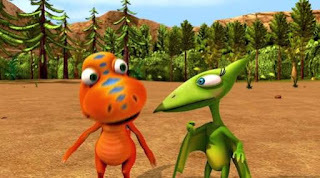 I loved dinosaurs as a kid, so much so that the highlight of my childhood was probably the release of Jurassic Park, a film title my three year old now uses interchangeably with the cartoon series Dinosaur Train. 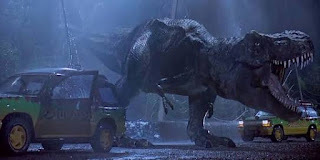 One a terrifying genre defining thriller where a team of scientists, capitalists and children are systematically hunted down by velociraptors or eaten off the toilet by a T. rex, the other a load of talking reptiles on a train. Easily confused. I feel, however, I may have been born before my time, given the sheer volume of dinosaur themed picture books presently in publication, each slightly more ridiculous in concept than the last. 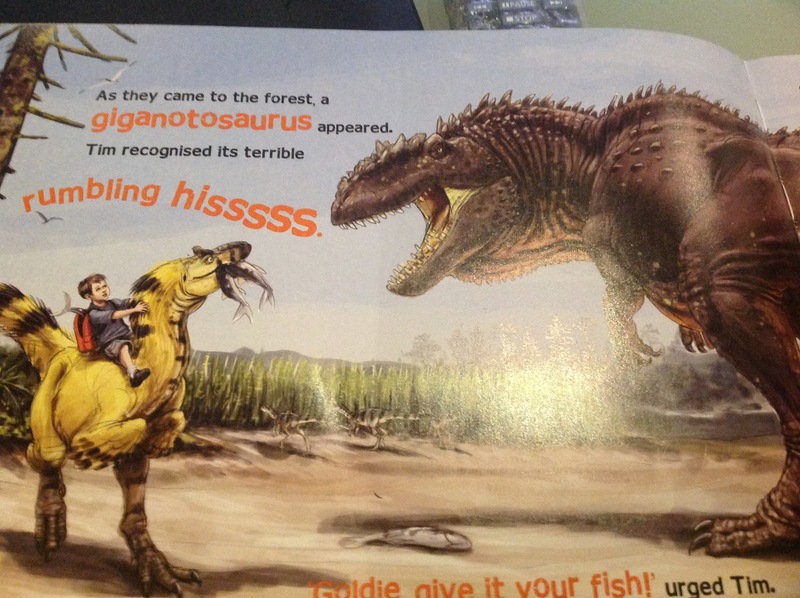 I've already reviewed one bizarre tome where a group of prehistoric reptiles are taken to the doctor. 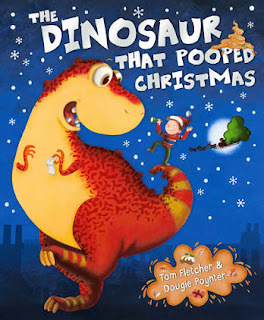 I haven't touched the frankly preposterous The Dinosaur who Pooped Christmas, nor the smililarly titled yet wholly differently stupid Dinosaur Poop. I had higher hopes for Dinosaur Rocks. Sure, it had that ludicrous juxtaposition of dinosaurs and humans again, but the illustrations of the dinosaurs at least looked more authentic. 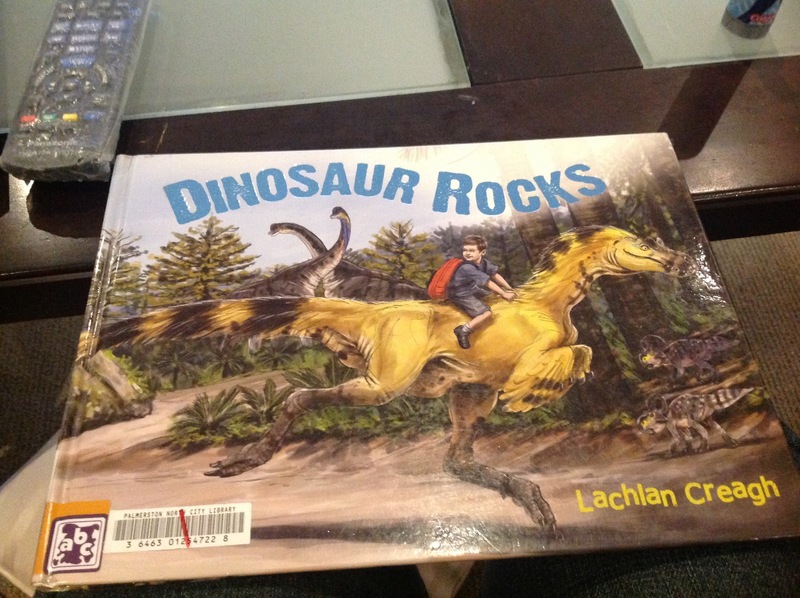 Dinosaur Rocks is a book with the noble aim of getting Australian children interested in Australian dinosaurs, a task that may otherwise require a trip to Canberra (aka Aulstralia's Palmerston North, but with added politicians). Unfortunately, even these desperate measures may end in futility: on entering the National Australian Dinosaur Museum, a 2 year old Luke freaked on being roared at by a small animatronic carnivore, and fled in tears, refusing to return. 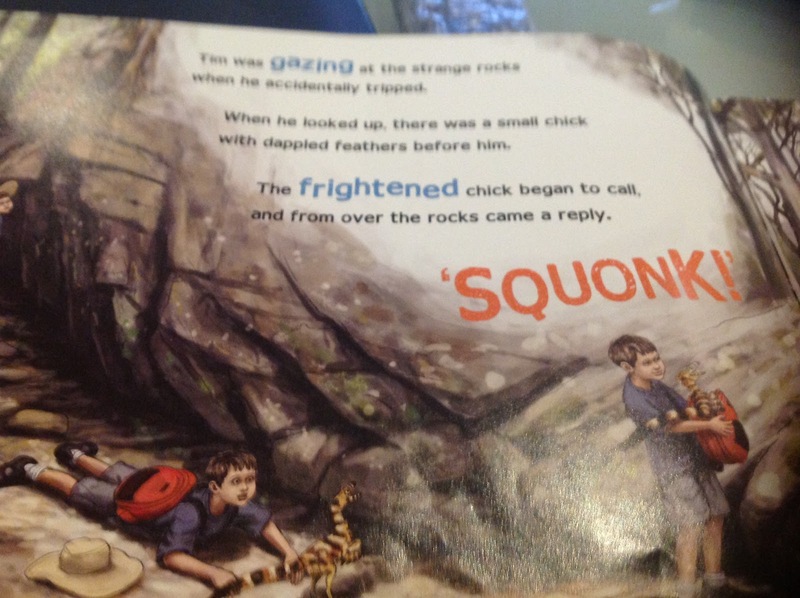 The book tells the story of a small lad, named Tim, packed off to spend some time with his BORING grandparents, presumably whilst his parents head off for a dirty weekend of romance of their own. His grandparents, used to raising children in a time when health and safety acts and child protection orders where non existent, send Tim off into the local forest, which, as it is IN AUSTRALIA remember, is probably home to snakes, spiders, crocodiles, sharks, drop bears, Ned Kelly, and bushfires. But they send a dog with him, so all good I suppose. 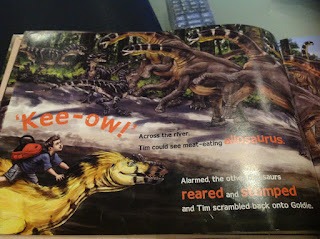 Against all odds, however, Tim avoids these dangers, instead falling down and hitting his head. Anyway, Tim eventually comes around, and returns to his grandparents. Immediately he starts babbling about seeing dinosaurs. But rather than show concern for their grandson's delusional outburst and apparent hallucinations, Grandma's first two concerns are that Tim has lost his hat, and he smells like fish. He needs a bath. Later, his grandfather continues to neglect Tim's need for a doctor, instead going so far as to humour him, showing him pictures of dinosaurs and asking which he has seen. Parents. grandparents. Childhood head injuries are serious. Seek medical attention if you suspect one.